Of 531,901 cases cleared (excluding cases in which juvenile offenders under 14 guided by the police and also cases in which an investigation confirmed that the act in question did not constitute a crime or that the conditions for prosecution or punishment had not been satisfied; hereinafter the same in this subsection) for non-traffic penal code offenses (excluding dangerous driving causing death or injury in a traffic accident; hereinafter the same in this subsection) in 2009, the complicity rate (percentage of cases committed in complicity with others to total cases; hereinafter the same in this subsection) of cases involving juveniles only (cases committed by a sole juvenile perpetrator or in complicity with other juveniles only) was 27.6%, higher than that of cases involving adults only (same as juveniles) of 15.6% (Source: Criminal Statistics by National Police Agency). 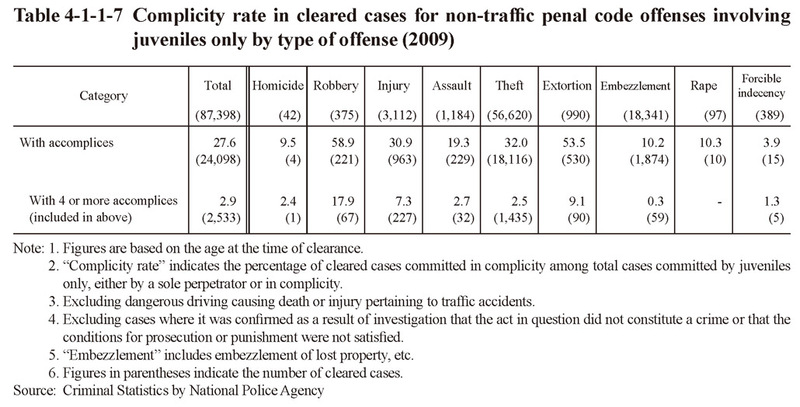 Table 4-1-1-7 shows the complicity rate in cleared cases for non-traffic penal code offenses involving juveniles only by type of offense in 2009. The complicity rate of cleared cases involving juveniles only was the highest for robbery at 58.9%, followed by extortion at 53.5%, theft at 32.0%, and injury at 30.9%, all much higher than those involving adults only (robbery 18.0%, extortion 35.6%, theft 17.8%, and injury 10.3%). In addition, the percentage of those committed by 4 or more perpetrators of cases involving juveniles only was considerably high for robbery at 17.9%, extortion at 9.1%, and injury at 7.3%.